Mickey Roker, a soulful and deeply propulsive drummer who carried a torch for literate hard-bop in the decades after its commercial peak, died on Monday in Philadelphia, where he was a local jazz institution. He was 84. Roker also had a highly visible tenure with the Modern Jazz Quartet, which he joined in the early 1990s as a sub for, and then a successor to, its longtime drummer Connie Kay. Roker appears, anchoring a battery of guests, on A 40th Anniversary Celebration, released in ‘93. But his core contribution to the band was as a road warrior. 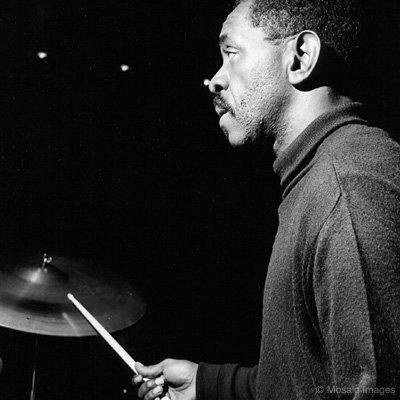 Earlier in his career, Roker was one of the most in-demand drummers of the 1960s, working with vocalist Nancy Wilson and vibraphonist Milt Jackson; pianists Ray Bryant and Junior Mance; and saxophonists Sonny Rollins, Stanley Turrentine and Gigi Gryce, among many others. He appeared on pianist Herbie Hancock’s modernist masterpiece Speak Like a Child (1968). Roker enjoyed an especially productive affiliation with another pianist and composer, Duke Pearson, who was also an A&R man and producer for Blue Note Records. Pearson’s bassist of choice was Bob Cranshaw, with whom Roker had an effortless bond. And from 1964 to ’70, there were no fewer than nine Pearson albums with Roker on drums. His personal favorite was Sweet Honey Bee (1967), with an all-star crew including Freddie Hubbard on trumpet and Joe Henderson on tenor saxophone. Here is “Sudel,” which finds Roker toggling without a hitch between Latin and swing rhythm. Roker had what jazz musicians call a good ear, and as a young man he could quickly commit to memory the details of an arrangement. He couldn’t read music when he first moved to New York, getting by for a while before he sought help from a teacher. In those early days, he also supported himself with his prowess at the pool table — earning his nickname, The Stroker, after saxophonist Jimmy Heath witnessed a display of his technique. Roker’s intensity as an accompanist is also well captured in this 30-year-old concert clip with a different all-star aggregate: Gillespie, Rollins, pianist Hank Jones and bassist Rufus Reid. They’re playing a 12-bar blues at a frenetic bebop tempo, and while it’s not a clean video transfer, the footage is priceless. There’s one stretch in the clip, just after the five-minute mark, when the rhythm section drops out to let Rollins and Gillespie trade barbs. Roker brings the beat back in with a press roll both subtle and irresistible in its pull. Don’t miss his dynamite drum solo, either, which begins at 6:40. Roker often shrugged off his skills as an improviser — “I’m not too much of a solo player but just a good time-keeper,” he said at the outset of a 2011 interview with pianist Ethan Iverson — but he certainly knew what he was doing. Granville William Roker, Jr. was born in Miami, Florida on September 3, 1932. His father, Granville, Sr., had come to the United States from Nassau in the Bahamas. Roker maintained the first music he ever heard was calypso, by way of the Bahamian community in Miami. One year my mother got me a drum made out of tin. But then the following Christmas I looked under the tree and there was a real drum. Man, I thought I’d died and gone to heaven. It was a parade drum, and it was the best gift I ever received in my life. Roker’s mother died when he was 9 or 10, and his grandmother brought him and his uncle to Philadelphia. (Granville, Sr. wasn’t much of a presence in his life.) His uncle, Walter James Bowe, bought him records and his first drum kit, serving as a jazz guru. Roker also found his first drumming hero: Philly Joe Jones, whose style became an early template for his own. After serving in the Army in the mid-‘50s, Roker began working in Philadelphia, playing rhythm-and-blues as well as jazz. He moved to New York in 1961, and made his way back to Philly in the early ‘90s. He reconnected with Shirley Scott, an organist and pianist who had established a regular gig at Ortlieb’s Jazzhaus, in the city’s industrial Northern Liberties neighborhood. Roker made himself at home at Ortlieb’s, not only with Scott but also as a bandleader and a house attraction. Through much of the ‘90s he was a weekly fixture, helping to turn the club into a smoky home base for local veterans like Bootsie Barnes, as well as a proving ground for upstarts like tenor saxophonist Eric Alexander. Along with Debra, his daughter, Roker is survived by a grandson, Michael; a granddaughter, LaToya; and a daughter-in-law, Deborah. His wife, Priscilla, died in 2001, and his son, Ronald, died in 2009. As the news of Roker’s death spread today, dozens of musicians paid tribute on social media, including old associates like trumpeter Randy Brecker and younger drummers like Ari Hoenig and Johnathan Blake.